Gason Rolls Out New ‘Bulked up' Air Seeder. Home > Gason Rolls Out New ‘Bulked up' Air Seeder. The Australian seeding and cultivation equipment manufacturer is unveiling its new ‘bulked up' 2150 series air seeder equipped with its revolutionary new SR meterbox system. The big new seeder series features bin capacities ranging up to 15,400 litres in a wider, longer, taller, heavier and more productive machine designed specifically for broadcare cropping for Australian sowing conditions. The 2150 series replaces the Gason 2120 series range as the largest seeder in the Gason seeder line up renowned for being engineered for the big country. Gason's Enginerring Manager Greg Gason says key features of the new SR Meterbox include improved metering efficiency, productivity and serviceability. The new meterbox is today being fitted to all air seeders in the Gason range with the exception of two smaller 1800 series models. “Features of the SR Meterbox include ‘side removal' of the meter wheel assembly for easy serviceability and interchangeability,” Greg Gason says. “The system has a standard six outlet housing which can be configured as a four or six outlet box. 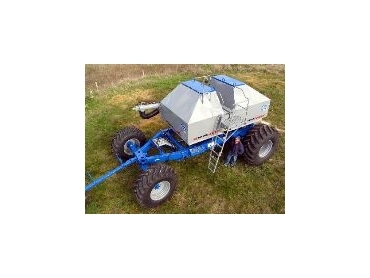 “The SR meter wheel handles the majority of seed and fertiliser products with minimal adjustment. “A hinged bottom hatch allows the operator to calibrate and clean out with ease. “An optional meter wheel shut off system facilitates easy change over of assemblies and a see-through, removable inspection panel provide alternative access to the meter wheel. An alternative meter wheel is available for use in sowing broad beans, Greg Gason says. The big new 2150 series air seeder range is available in four capacities with front and rear tow options. Unloaded the 2150 rear tow unit weighs 5200kg and fully laden weighs up to 20,600kg. Front wheel quad tyre sizes are 23.1-30 and rear tyres 900/60 R32.